Colombia is suffering from the worst drought it has seen in decades. This year, 15 indigenous children have died from dehydration and diseases related to lack of water. According to the Colombian Livestock Federation, nearly 60,000 animals have died as a result of the dry summer. But the Caribbean coast's wealthy tourist areas have yet to feel the effects of the shortage. They have as much water as they need to enjoy chlorinated pools and multiple daily showers, as impoverished adjacent communities struggle to collect enough clean water to survive. Gilberto Gomez lives, literally, in paradise — Paraíso, Colombia. I spoke with him as he strolled along a dirt path wearing a thin T-shirt and sandals, walking past his neighbors' crumbling brick shacks as well as pristine high rises that accommodate the upper-class tourists who frequent this tiny beach community. Salsa blared on the nearby Santa Marta boardwalk, shirtless tourists smoked cigars on the shore, and women in bikinis sipped fruity cocktails as they tanned. Unlike the people who visit this coastal tourist hub, Gomez spent his summer desperate for the one resource that seems overwhelmingly abundant here. After months of suffering his dry tap, he finally burst open an old underground water line. He ran home to retrieve buckets to collect the precious resource, but when he returned he found that a frenzy of neighbors had swarmed his "buried treasure" and would not let him get through. "We've gotten so hopeless that one street has fought against the other for the chance at water," Gomez said. "I can look over and know there's water there, and there," he added, pointing at beachfront resorts. "It's all because of the power of money. But, we're human beings too. Shouldn't we have the right to water?" Confronted with a year of nearly no rain — linked to El Niño Southern Oscillation, which increases surface temperatures in areas of the tropical Pacific — that right has become an all-consuming struggle for many citizens of Colombia, a country that already faced a serious strain on its water infrastructure before the drought began last November. Desperate residents ride mules and motorcycles to seek out wells, which more often than not are found empty or contaminated. Good Samaritans drive for hours across arid land to deliver water to distant civilians. People in Santa Marta showed us their improvised setups. They use electric water pumps to reroute water from broken pipes into their own reserve tanks at home. In photos: Elite soldiers compete in a special forces Olympics. Read more here. A Santa Marta resident using flexible tubing and an electric water pump to syphon municipal water. Just a five-minute drive over the hill, in Taganga — a poor fishing village that draws boho tourists and scuba divers — the government responded to protests over the lack of a water system by setting up a public tank, where people begin lining up at 7 AM to wait for officials to come fill the deposit. Buckets there have become a more valuable asset than indoor plumbing. "We've had no water in our pipes since December," a community leader in Taganga, Lorena Perdomo, told VICE News. "We've blocked the roads to protest, and travelled to Santa Marta to get water." "The state won't invest to help," she added, standing next to a 71-year-old woman with a cane in one hand and a water jug in the other. The ombudsman for the district of Magdalena — which encompasses Paraíso and Santa Marta — gave VICE News access to official documents revealing that millions of dollars invested by the federal government to improve Santa Marta's water infrastructure have gone unused by the local administration. Since 2012, the district has received nearly $13 million to make improvements. According to the documents, $5 million was put to use and almost a million was returned to the state. Where the remaining $7 million are is anyone's guess. From January to April 2014, the district received more than $3.5 million to build a "system for drinking water and basic sanitation," as well as an "aqueduct and sewage system." Only $500,000 — about 14 percent — of the allocated budget has been spent as intended. "The national government sent this money to our government to guarantee water for the poor," Albeis James Fuentes Pimienta, the ombudsman, told VICE News. "The people need it." He said his office has put pressure on the local administration, and that as a result the aqueduct's construction has been accelerated, though residents are still going without water. Pablo Escobar's notorious hitman is released amid controversy and fear. Read more here. Two men in Taganga load jugs of water into their car, in front of a sign that reads "free water." The federal government recently announced plans to invest $52 million for the expansion of aqueducts, treatment plants, and sewers in La Guajira province, adding that they would provide further emergency relief to residents in the remote desert area. Pimienta said that even infrastructure developments and national initiatives are unlikely to completely remedy the problem, however. Just last year a brand new aqueduct in southern Magdalena province was completed, but shortly after completion the local government was forced to stop using it. "The company was simply capturing water and not treating it," he said, recalling an incident that occurred last October. Pimienta and local residents complained that when they turned on the water, their taps spat out fish. In photos: A massive oil spill is threatening Mexico's third largest city's water supply. Read more here. 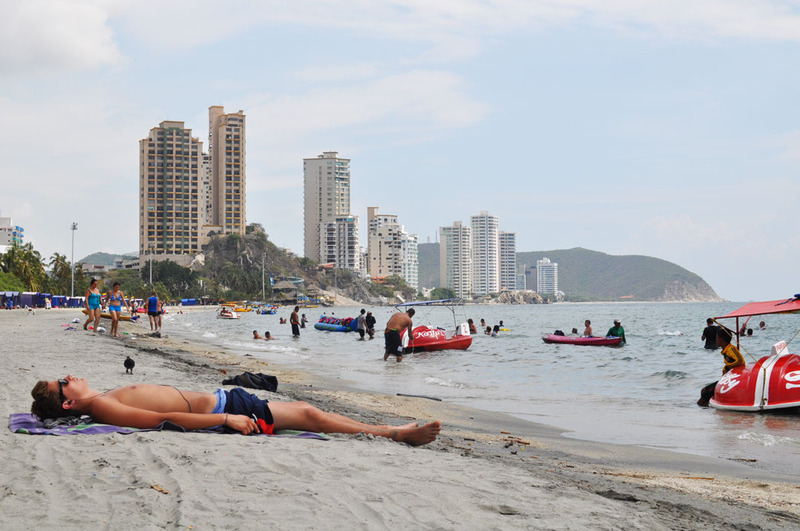 Santa Marta's exploding population further exacerbates the need for water. "This city grew in an incredibly rapid and disorderly way, and it needs new infrastructure," Pimienta explained, referring not only to the boom in tourism but also the hundreds of residents who have been forced to relocate to the region, displaced by Colombia's decades-long conflict. He and residents agree there is a significant discrepancy between water service for wealthy and poor areas. "People have been asking the government to build wells since last August," he said. "The inequality here is certain." A young man pushes jugs of water up the hill, toward his home in Taganga. Most tourists spend weeks soaking in the Caribbean sun without a clue of the shortage. Beau "Jangles" Robertson, a mustachioed Australian, has spent more than a month working at a popular hostel in Santa Marta. He even appeared in a Bacardi commercial while enjoying his beachside stay. "For me, Santa Marta has been one big party," Robertson said, enjoying the hostel's roof bar attired in a floral shirt. When I asked him about the water shortage, it was the first he'd heard of it. An upscale resort in Santa Marta appears to have no shortage of treated water. Carlos Sanabria, a spokesman for the local Santa Marta government, told VICE News that he was unable to comment on the unused funds. Instead, he blamed the local water company MetroAgua for inconsistent service. He said that he called for a water delivery four months ago, and it had yet to arrive. "This is not a recent problem," he said. "MetroAgua has been here for 25 years, and this city has never had continuous water. Every house has to have a well and a water pump. If you don't, you'll be without water. Why is that necessary? Well, that's the million dollar question for MetroAgua." Residents in drought-affected communities complain that the water bill continues to arrive, and payment is still being demanded of them regardless of whether or not they have actually received any water. Claudia Carrera, a Paraíso community leader, said that although she hadn't received service, she was billed 71,000 pesos (about $35) for a month with zero consumption. We spoke to Tonny Perez Mier, a representative of MetroAgua, who denied that certain neighborhoods had received preferential treatment. He said rationing was necessary after the crisis brought on by the drought, but could not explain why certain areas were targeted for rationing and others were seemingly unaffected. MetroAgua representatives said certain buildings have continuous service due to their own internal well systems and because they receive extra shipments from water trucks, adding that supplementary water tanks are sent to anyone who requests them. According to Mier, residents have been charged fairly. He said they were billed for charges to cover the cost of sewage, which continues whether there's water or not. He added that MetroAgua is working with the local government to build 31 new wells and capture and treat more water from local rivers. It's also working to improve and expand the city's aqueduct system to better serve Santa Marta and neighboring Taganga. Mier described this is part of a 50-year plan — but residents said they need water now. In La Guajira, few hours north of Santa Marta, miles of barren desert eventually run into the fluorescent teal waters of the Caribbean. The northernmost point of Colombia is home to various indigenous tribes. Only half of its population has access to running water. The United Nations World Food Program and government officials have been delivering emergency water shipments to the region. They are unable to reach everyone, however. Indigenous men assist the effort by driving trucks along a dirt path, pulling over every ten minutes or so to drop water jugs off at straw-covered shacks. The outskirts of Uribia, on the road to Cabo de Vela, in the Guajira province. An indigenous woman named Joselin Castillo told VICE News that she was recently forced to leave the rest of her family and her community in La Guajira last month in order to save her three suffering children. "My children were dehydrated and vomiting, and the only well was hours away," Castillo said, adding that she frequently rode a mule six hours round trip just to bring water for the family. The Uribia area has always struggled with water access, but in nearby Cabo de la Vela, a remote beach village on the Guajira peninsula that is considered a tropical getaway for foreign visitors, the government built an expensive plant to desalinate water from the Caribbean in 2011. The innovative contraption had been making salt water usable for everyday needs. But while it worked briefly, residents say it stopped functioning several months ago. The government has yet to announce plans to repair the water plant, and declined to comment on the issue. Now residents rely on shipments of water from friends that visit Uribia. An emaciated sheep sheep stands in the sun in Cabo de la Vela. "Our animals are dying," Cabo resident Diana Sepulveda told VICE News from the counter of her sparsely stocked supermarket, which she owns with her husband, an indigenous tribe member. "You have to have money to buy water here," Maria Elena Gomez, an indigenous woman who owns a local hostel, added. "But there are plenty people here who have none." She added that she and the other hostel owners all purchase their water from delivery trucks. Tourists who visit the exotic landscape are likely to miss the urgency of the problem, since they stay in hotels that buy water in bulk to retain basic services. A short drive up the road from where kite surfers wheel across Cabo's soft waves, Aurora Brugeis, an indigenous mother of six, was herding her skeletal sheep and before preparing to bathe with a bucket of dark brown water her son had retrieved an hour away at the closest well. Plastic microbeads from body wash are contaminating the Great Lakes. Read more here. A young girl in Uribia sits on a cart used to transport a styrofoam container of water. One guest we spoke to in Santa Marta was at least somewhat aware of the crisis. "I have to take three showers a day, or I get too sweaty," a 34-year-old Los Angeles lawyer named Bob said while sharing a cigar with his friends. "Well, here I am only taking two." Wasting water in California will now cost you $500. Read more here.